At the age of 47, Sadek Shunnar has been in the software solutions market for over 26 years, helping clients implement mission critical systems. Sadek has helped numerous institutions adopt the latest web technologies to streamline their business and achieve higher efficacy – document management, content management, and e-services portals. He has also contributed significantly to spreading e-government and e-payment concepts and model implementations in the MENA region. Sadek holds an MA in Enterprise Management from Durham University (2006/2007) and received his B.Sc. in Computer Science (Minor Accounting) from Yarmouk University in 1989. Entrepreneurial in nature, he co-founded and led the establishment of several companies and joint ventures during his career. In October 2010, Sadek founded Applixya: a progressive and pioneering IT innovation provider specialized in eSignature mobile applications. Co-founder Waleed Mashaqbeh has been in the enterprise software solutions development for the past 16 years, designing and implementing mission critical systems web solutions and core systems; especially in the e-payment and e-business domain. Prior to co-founding Applixya, he had played several critical roles in STS Co., foremost of which was being the Technical Architect of PayOne payment gateway solution. During the past several years, in addition serving as the co-founder and Chief Technology Officer of Applixya, Waleed has worked on the design and implementation of Applixya’s Flagship products: iApproval and SignBox, directly contributing in leading Applixya to emerge as an innovative leader in providing iPad-based corporate business applications. The other co-founder, Khalid M. Jumaa, has been in the software industry for the last 11 years, worked with a number of large and medium-sized enterprise solution providers, thus contributing to the design and architecture of large enterprise software systems. Khalid has extensive in-depth knowledge in different domains: mobility, mobile platforms, and data security, among others. For the past several years, while serving as the co-founder and Mobile Technology Architect of Applixya, Khalid has also helped Applixya to become what it has today. Applixya provides eSignature applications to all levels of officials, CxOs, executives, managers and individuals via several offerings (iApproval standard edition, SignBox, and soon-to-be-released BoardBox). Board members, c-level executives and high-ranking government officials are more often on the move than at their office. So business is hindered often by their physical unavailability at the office to timely do things such as: approve a document, decision, or formally and securely sign a document; review correspondence, meeting packs, add notes and comments, and take action; channel work within the organization and collaborate with peers; receive updates as they happen. The constant mobility of nowadays executives or officials renders such targets unattainable. The advent of the iPad in April 2010 inspired the vision of redefining how such corporate executives and high-ranking officials would interact with their own business using smart tablets. The Applixya team pledges their expertise to conveniently mold enterprise-level security, protection and privacy into affordable, simple and convenient boxed solutions to all levels of executives around the world, profoundly changing the landscape of documents on the go. With over sixty cumulated years of background in highly secure enterprise solutions, they’ve intuitively foreseen the proliferation of smart tablets in enterprise, and foremost with the early-adopter executives who are eager to streamline their decision making process and cope with the new agile approaches to business management. All of these apps were architected, designed, and developed with the same enterprise-level security and privacy in mind. iApproval and SignBox are their contributions in bringing enterprise-level technology to the masses – with simplicity and convenience, yet maintaining the highest level of security and privacy. The biggest challenge for Applixya was being able to get across and trigger awareness with clients. Every individual, manager, official, and executive should be able to sign work or personal documents (.pdf) without the hassle of setting up and account or having to register with a paid subscription and without having to compromise their signature or Documents to the solution provider or recipient. All of their competitors’ solutions require subscriptions and cloud access to seal the signature onto the document, not to mention that the document is usually transferred to their cloud. 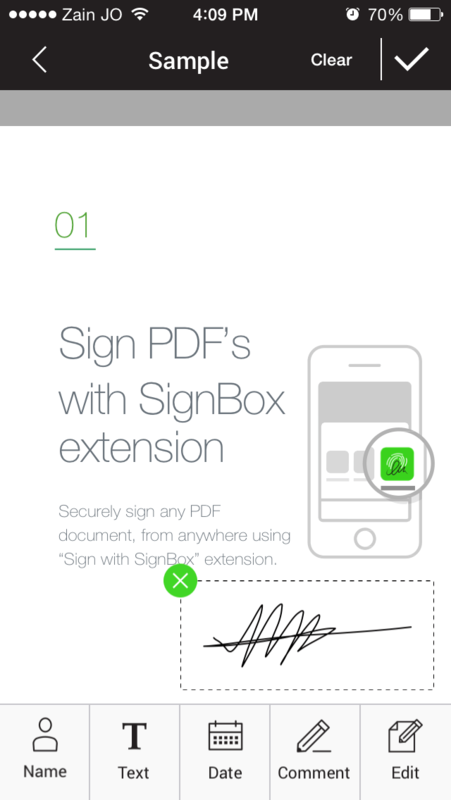 Adding the stroke-based signature onto the .pdf within the iPhone or iPad in such a secure and clear fashion is not offered by any of Applixya’s competition. Many, if not most .pdf editing apps do compromise the signature, with it being removable, printable, editable. Applixya intends to provide their technology in all possible flavours without compromising any security or privacy standards that they’ve already set within their solutions. The vision is to continue providing alternate editions of their software to suit different signer’s need whether it is an individual or entrepreneur who needs to infrequently sign documents securely, or an SMB manager, or an enterprise executive. Every individual, manager, official, and executive who needs to sign work or personal documents (.pdf) without the hassle of setting up and account or having to register with a paid subscription and without having to compromise their signature or documents to the solution provider or recipient. Signbox adopts a freemium model, while approval software is licensed per individual platform user. Berufy Helps Match The Right Employee To The Right Employer!